Greg graduated from G.A.R. Memorial High School, lettering 4 y football, basketball and baseball. Twice Greg was all-state and league MVP in basketball while earning all-league in baseball 2 seasons. In football, he was first-team All-American and Gatorade Pennsylvania Player of the Year in his senior season as offensive lineman for G.A.R. Greg started 4 years at the University of Michigan, named All-American and All-Big Ten as senior captain. Greg played in the Senior Bowl All-Star game and was a finalist for the Outland Trophy, awarded to college football’s top offensive lineman, while helping Michigan’s offense average 439.2 yards per game. He was Big Ten Lineman of the Year as a junior in 1990 and part of an offensive line that shared Gator Bowl MVP honors after the Wolverines amassed 715 yards on total offense, setting Michigan and Gator Bowl records. Greg started 48 consecutive games as offensive tackle at Michigan. 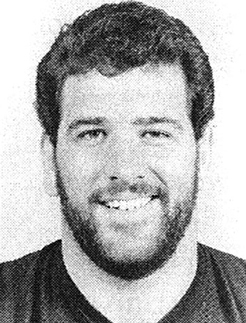 In 1992, Greg was selected by the Raiders in the second round (32nd overall), where he played in 10 games as a reserve at both tackle and guard. In 1993, Greg was inactive due to a left ankle injury in a pre season game. In 1994, Greg rebounded, becoming starting right tackle versus Atlanta and starting the final ten games of that season. In 1995, Greg started 14 games for the Raiders. Greg was the first unrestricted free agent signed by the Panthers in 1996. Greg is now retired from pro football and resides in Wyoming Valley with his family. Greg is involved in many business and philanthropic ventures and is the head football coach at Bishop Hoban High School.